Are you giving gift cards to some of your friends and family for the holidays? Gussy them up with a handmade touch! 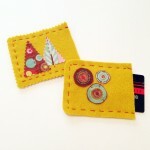 My latest tutorial on Magic City Post is for easy, folksy, handsewn giftcard slipcovers. It’s a really fast, fun project for novice and expert sewers alike.